When I was brainstorming new recipes for the blog this week, I almost completely forgot Easter was sneaking up just next weekend! How could I forget? Now ya'll know by now I love a good theme, so I knew I wanted to make something that included candy eggs, peeps, … or maybe both! 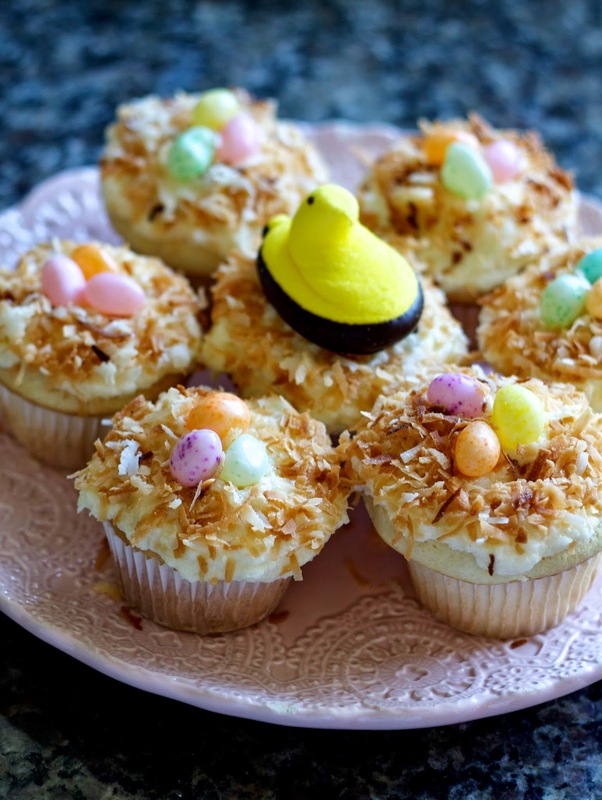 And so, Toasted Coconut Cupcakes were born. I'm on a bit of a coconut kick lately (it's great in Energy Balls), but lightly toasting the coconut flakes in the oven takes the flavor and texture to a whole new level. Because I started with a boxed cake mix, these couldn't be faster or easier to put together. You could even use store bought icing and add a touch of coconut extract if your heart desires, but I do prefer making my own. Prepare the packaged cake mix as instructed, and add in 1/2 tsp. coconut extract. Bake as cupcakes in a lined pan. After the cupcakes are done, set aside to cool on a wire rack. Arrange coconut flakes on a sheet pan and bake at 350 for 8-10 minutes, stirring once, or until lightly toasted. To prepare the frosting, cream together butter and cream cheese. Add remaining coconut extract and powdered sugar and beat until smooth. 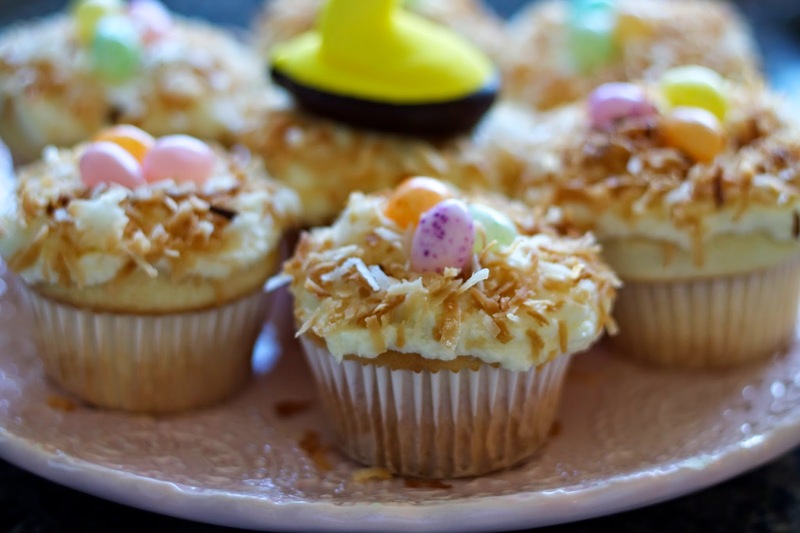 Frost the cooled cupcakes and sprinkle with toasted coconut around the edges. Add candy eggs or peeps in the center. Enjoy! *These cupcakes have a mild coconut flavor. For a stronger coconut taste, increase the amount of coconut extract in the batter to 1 tsp.. For the frosting, taste and add more to preference.